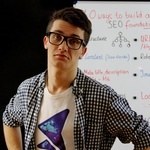 I'm the Head Wizard (Founder) at Solvid, a creative SEO and Inbound Marketing agency based in City of London, UK. My work has been mentioned by various influencers, including Rand Fisking of Moz, Brian Dean of Backlinko & more. I'm currently a contributing author to numerous publications, including Huff Post, TNW, Kissmetrics, GoDaddy, Sitepoint, Crazy Egg, B2C, GetResponse, SEMRush, Specky Boy & more. We'll produce a compelling, engaging and factual 1,000+ word article/blog post. The article is researched and produced by one of our in-house content marketers, who are all native English speakers and have experience in Journalism, Media & Content Marketing. ✓ Optimised for search - at the end of the day, we're an SEO agency. Feel free to contact us should you have any questions! Great writer, solid communication, and speedy delivery. Would definitely recommend! Great writer and speedy turnaround time! Solid work once again from Dmytro. Reliable, cost effective, multi-faceted, and adheres to the brief. Head Wizard (Founder) at Solvid. Contributor for Huff Post, TNW, Kissmetrics, GoDaddy, B2C, Crazy Egg, SEMRush & more. Head Wizard at Solvid, a creative SEO and Inbound Marketing agency based in City of London, UK. I specialise in Search Engine Optimisation, Content Marketing & Outreach. My work...Read moreHead Wizard at Solvid, a creative SEO and Inbound Marketing agency based in City of London, UK. I specialise in Search Engine Optimisation, Content Marketing & Outreach. My work has been mentioned by various influencers, including Rand Fisking of Moz, Brian Dean of Backlinko and more. I'm currently a contributing author to numerous publications, including Huff Post, The Next Web, Kissmetrics, GoDaddy, Sitepoint, Crazy Egg, Business2Community, GetResponse, SEMRush, Specky Boy and more.